Rinpoche during the FPMT Australia National Meeting, April 2011. Rejoice! – We Welcome A New Study Group! Happy 30th Birthday to Atisha Centre and 10th Birthday to the Maitreya Project Heart Shrine Relic Tour! Rinpoche with Cherry Rattue, director of Atisha Centre during the FPMT Australia National Meeting, April 2011.
and the ultimate peerless happiness of full enlightenment. Everybody is gathering here for sentient beings, for Dharma, to subdue one’s own mind and to actualize bodhichitta, the most important thing in life, the most important project in life. On the basis of that, to actualize the resultant vehicle – the Secret Vajrayana – and to liberate numberless sentient beings from oceans of samsaric sufferings and bring them to full enlightenment, that is the ultimate goal of our life. I don’t have any qualities to help with that, but I know two or three words – the Buddha’s words. We will see what happens, maybe something crazy. You never know where it leads. First, I want to say thank you to all the old students who I have met many times in the past who are gathered here. I want to express thank you very much for that. Life is not long, life is short, so it is very good to do something most worthwhile in life. Death is definite and the actual time when it will occur is uncertain and nothing at all will benefit at the time of death except Dharma. Nowadays, in the world, it is over-degenerated. Due to degeneration of the mind, there is degeneration of life and life becomes shorter and shorter. There are so many sicknesses happening, so many people dying from cancer – millions and millions of people – and then there are other sicknesses, life-threatening diseases. Then there is the degeneration of sentient beings, degeneration of time, and so many wars, tsunamis, earthquakes. Just referring to recent times, there was New Zealand and then Japan [where there was the] most unimaginable tsunami. They cannot find out how many people died. And a few days ago an earthquake happened in Burma. There are so many dangers happening – danger of the four elements: earth, water, fire, wind. This is happening more and more; you can’t really tell in which country it will happen next. Nowadays, there are so many people dying due to that. Therefore, it is time to do the best in your life … to do the best in our life, do the most worthwhile, most beneficial thing in our life. Colophon: Teaching given on April 2, 2011 at the Great Stupa of Universal Compassion, Bendigo, Australia. Typed simultaneously as Lama Zopa Rinpoche taught by Ven. Joan Nicell, edited by Claire Isitt and Michael Jolliffe. Lama Zopa Rinpoche with Ven. Lhundrup (director of Thubten Shedrup Ling Monastery), Ven. Gyatso, and George Manos (director of Buddha House) on the “yellow brick road” built by Ven. Gyatso to connect the monastery with Atisha Centre. Three short teachings by Lama Zopa Rinpoche have been added regarding the purpose and importance of practicing Lama Chöpa and the meaning of tsog. You’ll find these teachings in “Commentary on Lama Chöpa” under Special Commentaries. A new Living in the Path module, Happiness of Dharma, is now available online! In this course, Lama Zopa Rinpoche inspires us to recognize the opportunity that is our perfect human life and to take full advantage. We are reminded that while life is short, we can still ensure success in obtaining all levels of happiness. Basic Program‘s newest graduate is Alan Carter, currently resident teacher at Chandrakirti Centre, New Zealand. Congratulations! Chenrezig Institute will begin Supplement to the Middle Way (Madhyamakavatara), a subject of the Masters Program in mid-2012. Thanks to all who have sent in their Discovering Buddhism course and retreat dates! The Discovering Buddhism Retreats page is being updated to reflect this new information. Charity for Ants: This short practice specifically designed to benefit ants was compiled by Lama Zopa Rinpoche and is inspired by a text written by Ngulchu Dharmabhadra. Available now! As per the March 23 advice from Rinpoche on how to protect against radiation, the White Umbrella Deity text to wear as a protection is now available on the Advice page (under Natural Disasters). Also new on the page is a short practice on how to stop rain. An updated comprehensive list of all materials available from Education Services is now available! A new protection is now available in hard-copy and electronic formats. This image is said to have been worn by Lama Atisha as protection against physical harm. Lama Zopa Rinpoche says the image can be put on the body of a person who is dying, put in the house to protect against pollution or disharmony, or worn on the body. Essential Buddhist Prayers, Vol. 1 has been updated and is available in hard-copy and e-reader formats. Service as a Path to Enlightenment: A new booklet featuring advice from Lama Zopa Rinpoche. Although the booklet is being sent out with the FPMT Annual Review 2010, copies will soon be available from the Foundation Store for the general public. The Sanghata Sutra is now available in e-reader format suitable for iPad and Kindle. 108 Names of Tara, translated by Corey Jackson, is now available. A Guide to the Most Sacred Five-Peaked Mountain of China (Wutaishan Mountain), translated by Tenzin Bhuchung, is coming soon! Thirty-two people are registered to attend FPMT’s first translation conference at Istituto Lama Tzong Khapa in May with Yangsi Rinpoche as keynote speaker. Look out for the July-September 2011 issue of Mandala for a full report. A two-day Foundation Training will follow FPMT’s first translation conference at Istituto Lama Tzong Khapa, May 21-22. “The Road to Kopan,” a new feature of Mandala Publications, wants to hear from you. For 40 years, thousands of students from across the globe have made their way to Nepal and up to Kopan Hill. Some paths were long and winding, some direct and clear. Mandala is collecting these stories and you can help us. Have you attended one of the annual lam-rim Kopan retreats? How did you find your way there? What about the experience felt like coming home? With every issue of Mandala, we’ll share another story and feature many more on our website. If you have a story or know someone else who does, please e-mail us at: laura@fpmt.org. Thanks to the French Translation Service for translating this essential and informative booklet into French. You can download it from the “Teachers” section of the FPMT Affiliates Area. 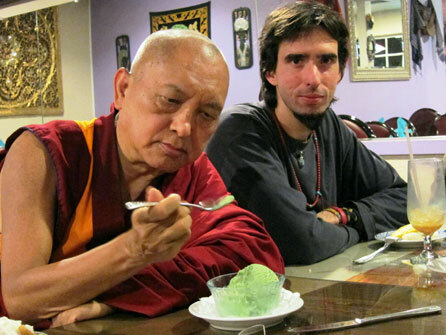 Lama Zopa Rinpoche with Osel in California, March 2011. This brings the total number of FPMT centers, projects and services to 160 in 39 countries! Geshe Drakpa Tsundue is teaching at Centre Kalachakra, France. Geshe Losang Khedup is teaching at Khamlungpa and Bengungyal Centers in Mexico. The sixth Lotsawa Rinchen Zangpo Translator Program will begin on March 15, 2012 in Dharmasala, India. The LRZTP is FPMT’s interpreter training program, training people to interpret for geshes resident in FPMT centers around the world. Atisha Centre celebrated its 30th birthday day this year – a significant milestone for a center dedicate to benefiting and serving all of living beings. Congratulations! 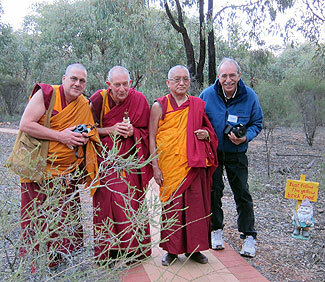 On March 14, 2011, the Maitreya Project Heart Shrine Relic Tour turned 10 years old. The tour began in Taipei a decade ago, and today – 58 countries, 571 events and 6 continents later – it continues to bring blessings and inspiration to people all over the world. FPMT International Office, USA is looking for a Chief Operating Officer; Root Institute, India is looking for a spiritual program coordinator and Mahamudra Centre, New Zealand is looking for a centre manager, a vegetarian cook, a housekeeper and a groundsperson.